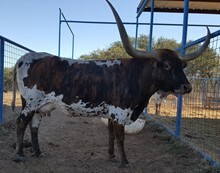 Welcome to Robeson Ranch raises Registered Texas Longhorns in Gordon, TX. We moved to the ranch in 1998 after purchasing the property for our son to live on when he went to college in 1995. We had raised beef cattle until December of 2012 when we sold out. We have had goats for 11 years and also raise chickens. We decided to get back into the cattle business this spring and after seeing that Doug and Sandy Stotts were raising longhorns we decided that we would purchase some and give it a go! So far we are enjoying them and cannot wait until the young heifers begin calving next spring. Each day is a new adventure with them.